Kurt Ekert of Carlson Wagonlit Travel has been appointed vice chair of the U.S. Travel and Tourism Advisory Board . Special events business news this week includes a big new role for Kurt Ekert of Carlson Wagonlit Travel. Kurt Ekert, president and CEO of Minneapolis-based Carlson Wagonlit Travel, has been appointed vice chair of the United States Travel and Tourism Advisory Board by U.S. commerce secretary Wilbur Ross. Established in 2003, the board advises the secretary on key matters affecting U.S. travel and tourism and provides a forum for industry-related discussions. Visit San Antonio has hired Shauna Goodman as associate director of destination experience. Nicholas Malloy has been named executive chef of the Rose Hotel Chicago/O’Hare. Stefanie Rigazzi has joined Town and Country Event Rentals, based in Van Nuys, Calif., as an event director. 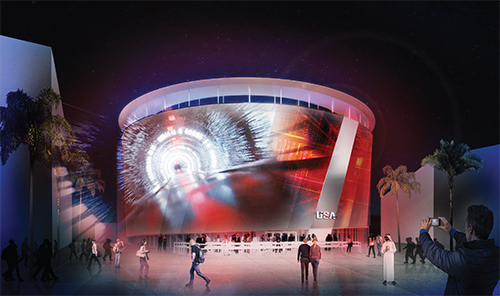 George P. Johnson, based in Auburn Hills, Mich., has released renderings for the United States’ National Pavilion, which will be featured at Expo 2020 Dubai (above). GPJ selected the pavilion’s theme “What Moves You?” and is designing an in-pavilion tour of American experiences, opening on Oct. 20, 2020. GPJ’s partnership with the Pavilion USA 2020, the organization responsible for the United States’ National Pavilion, was announced in July. Shaun Davis has joined the Los Angeles Convention Center as vice president of operations. Nancy Lindemer, director of sales marketing at Destination Hotels, has been elected president of IACC Americas. Sparks, Nev.-based Creative Coverings has named Lauren Bergenholtz as business development manager for the northern California region. Big contract feeder Centerplate announced that its contract to provide food and beverage service at the Miami Beach Convention Center has been extended. Do you have special events business news to share with us? Please send it here--thank you.